What about those giant exercise wheels in the dog yard? How do they work? We have been getting a lot of requests about the exercise wheels shown in so many clips, including the one on our DVD, For the Love of Dogs! We have never put any dogs in the wheels, they simply hop in at about 4 to 6 weeks. At first they take a few steps and stop. The wheel will start moving and the pup will stop walking, the wheel will gently rock back and forth, within days of discovering the "new toy", the pups will hop in and run at their pleasure. In the summer we sometimes have to lock up the wheels or take certain dogs out of the pens so they don't overdue it. How do weather conditions affect the race, you and the dogs? Weather can be a big factor in any race. Deep snow can slow you down and hard, icy trail can be too fast. In extreme cold we prevent dogs feet from being cut by sharp ice crystals with booties. No matter what the weather - it's the same for everyone. What does it take to train a puppy and prepare them for a race? At what age do you usually start training? I start training the puppies at about 9 months old. They go short distances with old-time dogs and they learn most from them. I make the runs a lot of fun for them. 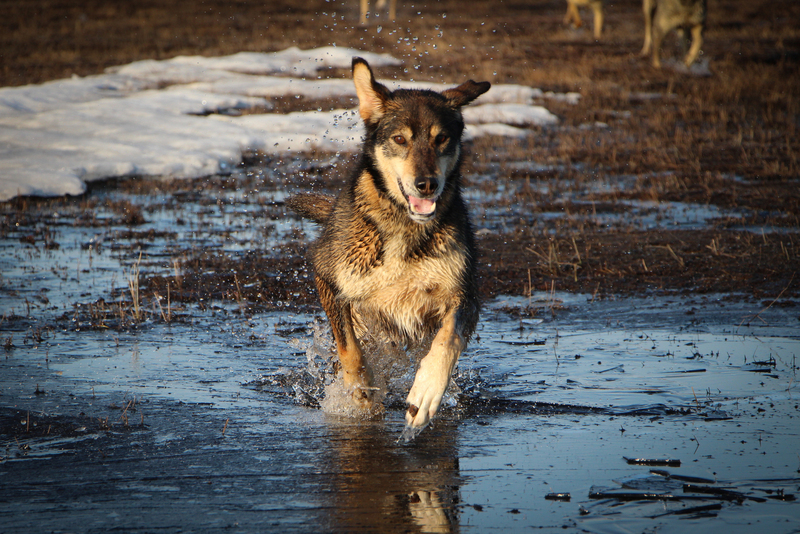 A good sled dog is a lot like a good person: honest, hardworking, friendly, with a positive attitude, and curious. Other dog characteristics include good appetite, good feet, and an ability to run fast for a very long way! The physical traits and muscular structure of the dog's body are important, but the best dogs are the ones with heart, willingness, and the desire to get the job accomplished. Lead dogs show signs of being leaders from puppyhood. They are usually very curious and spunky. As they get older, they show that they like to be in charge and can learn the commands very quickly. What are your dogs' names? (In our family), we sit around the dinner table and think of theme names for litters. Pups born at Christmas have reindeer names. We never name them right away. We wait to see their personalities. My dogs have names like Blitzen, Blondie, Fearless, Ingot, Kira, Melkior, Odo, Riptide, Stream, and Worf. How do your dogs deal with the freezing temperatures? To them, of course, these temperatures are comfortable. They are used to being in them. They perform better in cold temperatures than in hot. When it gets really cold, though, we have to be careful that the dogs don't get frostbite. We protect them with dog coats and blankets, and we make sure they are not too exposed. 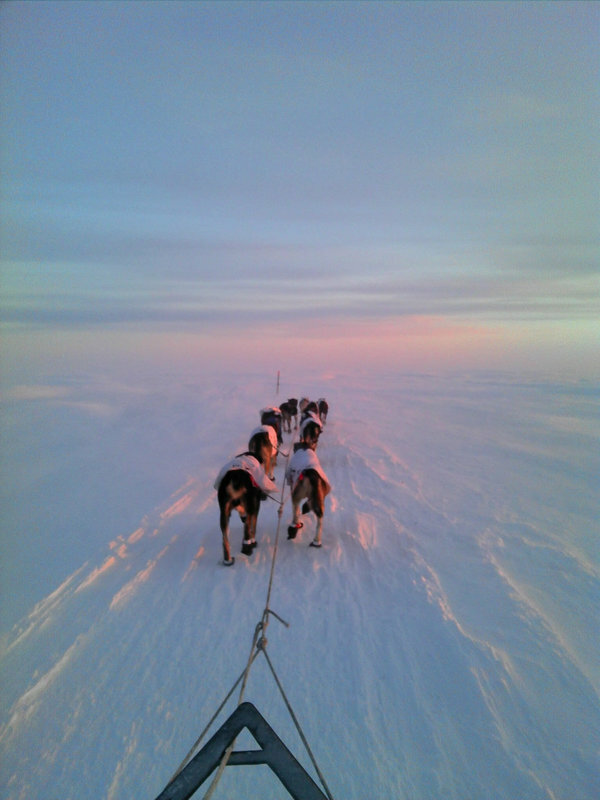 Is there a special bond between the dogs and the musher? I am very, very close to my dogs. They usually let me know how and what they are feeling in their own language. It's dog language - a lot of body language. It takes a lot of intuition: I know the dogs really well and understand what they want. It is just communication on a different level. It's like knowing your child is going to be sick before the child actually gets sick. 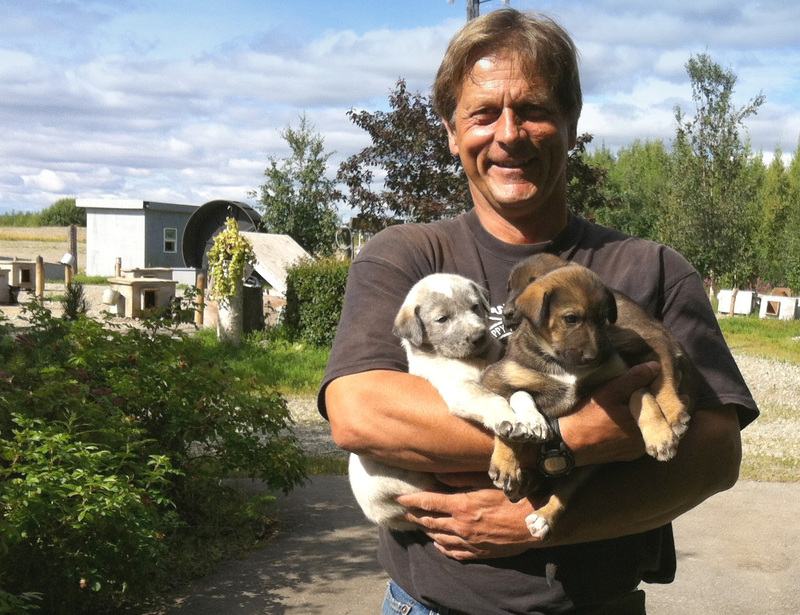 What does it feel like to cross the finish line, and complete the Iditarod or any race? Mostly I feel a sense of pride in what my dog athletes can do. No other animal on the planet can sustain and master what racing sled dogs do. I am always in awe of their ability both mentally and physically. How do you reward your dogs after the race? They get the best food, the best attention - all kinds of hugs and treats and walks - just continued love like they get all along anyway.